Winter in Japan is cold. It feels so good walking into a warm heated building. One of the most convenient warm places is the convenience stores you see almost on every corner. They sell all sorts of useful things, including hot food. The most traditional of these is probably Oden. 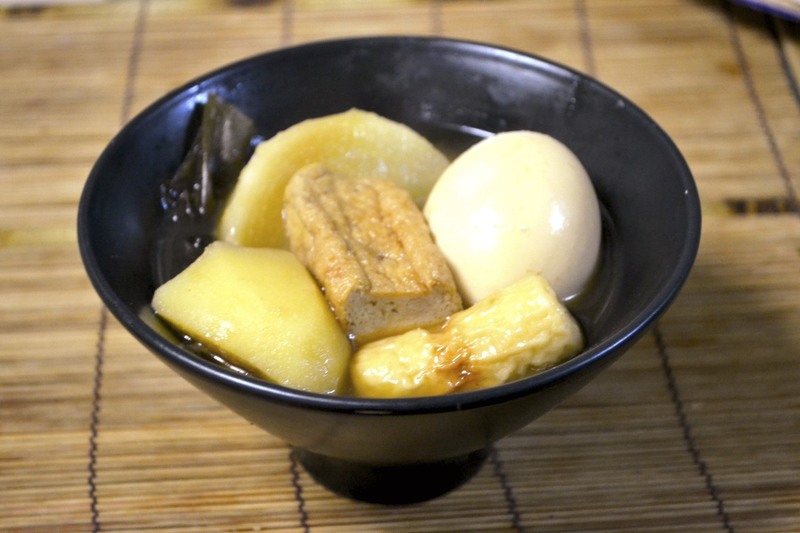 You choose your selection of various fish cakes, tofu, egg, daikon etc, and pay 60c~$1 for each piece, which is served to you in a cup with some warm broth. Then you walk out of the 7-Eleven, into the cold again, but this time you have something warm in your hands, which is going to feel sooo nice and warm in your stomach. mmm. 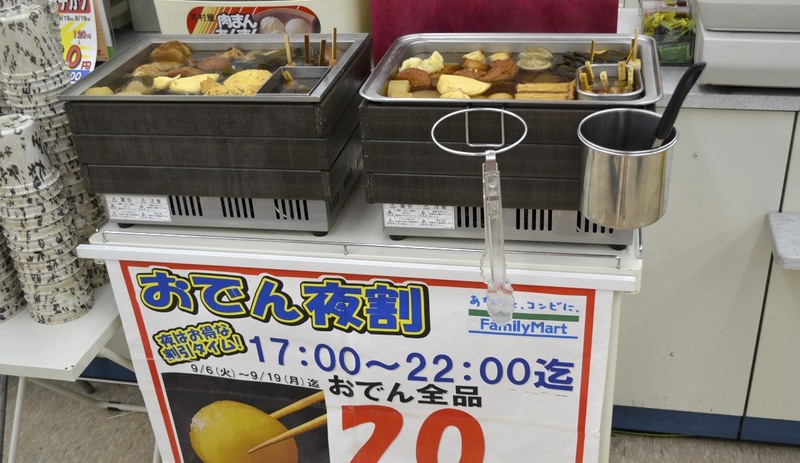 It's winter now in Australia, so that's why I had a craving for oden recently. 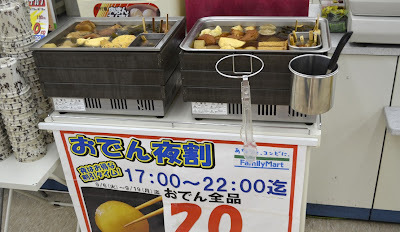 Instructions for Oden: Take a cup from the left and use the spoon or tongs (on the right) to pick which items you'd like, and take a little broth with it. 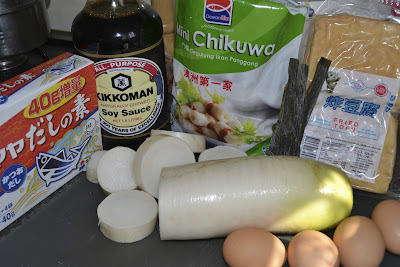 Boil the soup, add the goodies (put daikon at the bottom so they cook well), boil, then simmer for 30-40 min until daikon is softened. 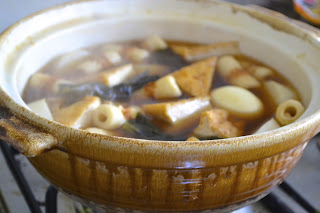 Oden is usually served on its own if eating outside, but when eating it as a meal at home, serve with a separate bowl of steamed rice for each person. The pot is served on the table and each person has a small bowl which they eat from, picking out the pieces they want to eat and refilling their bowl. It is cold in Australia!!! 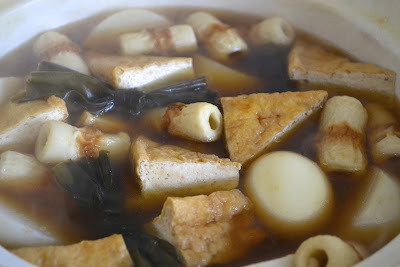 Oden sounds yummy... will ask my mummy if she will make it for me!